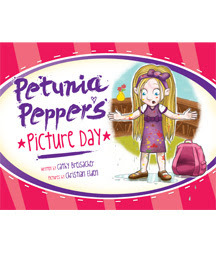 twice is nice: "Petunia Pepper's Picture Day"
Poor Petunia Pepper! Every year disaster strikes her on school picture day. Puffy hair, pumpkin-style smiles and pink eye help create pictures that only her family could love. But this year, Petunia promises herself things are going to change. She plans carefully for the perfect picture day. Unfortunately, she misses the school bus and begins a series of misadventures that lead to yet another picture day fiasco. In the end, Petunia spots her picture on the front page of the local paper, featuring her heroic rescue of a runaway poodle. Now that's a picture everybody in her class will love! What a great story this was! It was sweet, loving, motivational, funny, heartbreaking and surprising (my kind of book!). I loved this quote at the very end of the book, "He (God) made you, and He loves you just the way you are! "...that quote sums up the moral of the story - that you are beautiful no matter what you look like, or what you may have been through. I am not a religious person, but I love that I can read these books and feel all warm and fuzzy inside. I can't wait to share this book with my girls when they are a little older. I would say pre-k and up would be the perfect age to read this book. It would be perfect for a read aloud in any elementary classroom! To learn more about the book, click here. You can be a fan on Facebook! This book can be bought on Amazon (became available in 2010). Thank You so much Net Galley and Warner Press (Kids) for allowing me to read this book! I cannot wait to read more books from you in the future!